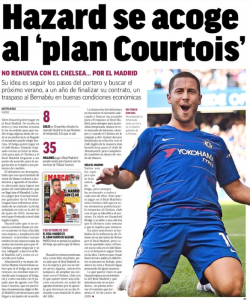 Marca yet again made big claims about Eden Hazard in their Wednesday edition. The Spanish newspaper are really ramping up a campaign now which may well end with the Chelsea player moving to Real Madrid. They’re not the only ones, and the potential transfer has been covered across the Spanish media. 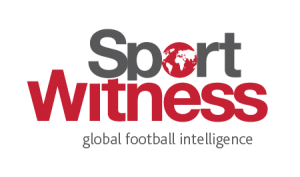 AS conducted a poll of their readers this week to see if Madrid fans wanted Hazard signing in January or the next summer window, more than 30,000 people (over 80%) plumped for the next window, clearly wanting the Belgian international as soon as possible. Marca’s idea is that Hazard will work in a similar way to Thibaut Courtois and refuse to renew his contract so he can force a move. It’s stated that Roman Abramovich and Marina Granovskaia are ‘well aware’ of the situation and how they’ll have to plan accordingly regarding Chelsea transfers. Hazard won’t push as much as Courtois did for a transfer, believe Marca, but he does expect a move from Madrid and won’t renew whilst he believes there’s a chance of the transfer. As it stands, the attacker ‘doesn’t despair’ over his potential exit.